Last week I wrote about the East Frisian tea ritual that creates a deeply satisfying cup of tea. I loved learning the history and culture behind this tea. 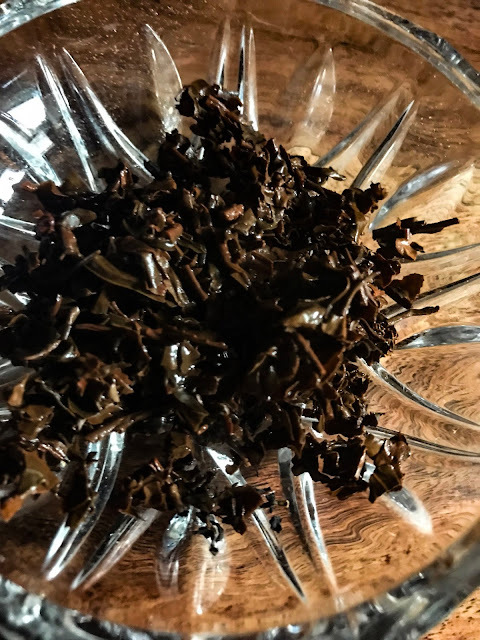 This week's post is a review of the East Frisian BOP blend from Upton Tea Imports that I used in last week's post. I've been drinking it all week with and without the added cream and sugar, so it's definitely time I give it a full review. It's not easy to find true East Frisian blends in the US, and I was excited to see that Upton sells more than one. Upton has two main blends to choose from, the BOP (broken orange pekoe) blend and the TGFOP blend (tippy golden flowery orange pekoe). I'd normally go for the TGFOP which has full leaves, lots of tips, and more complexity. But, I wanted the closest thing to a strong East Frisian blend, so I went with the BOP. The broken leaves steep up quickly and produce a stronger brew. Also, Upton referred to the BOP blend as the 'classic' brew, so that sealed the deal for me. The dry leaves have a raisiny aroma, with honey and a bit of malt. Smells like an Indian or Sri Lankan tea blend, and Upton's website says it's an Assam blend. The leaves are orthodox (whole, not CTC) broken leaves, with some lovely golden tips peppered throughout. I tasted the tea two ways- straight, and prepared with the addition of sugar and cream in the East Frisian tradition. This tea was blended for the addition of cream and sugar (as many breakfast blends are as well), but I wanted to try it both ways to get a true feeling for the tea. I prepared the tea as instructed- 1 tsp per 6 ounces of water, steeped with boiled water for 3 minutes. The tea steeps up to a beautiful dark mahogany color. Sips of the tea on its own are quite bracing but surprisingly not too astringent. There isn't much nuance, but it's malty with bitter notes of unsweetened chocolate. The liquor is a bit drying on the palate with a malty finish. It's fully bodied and thick. I think I'd cut back slightly on the amount of tea if I was drinking this straight. Pouring this tea over a lump of sugar (kluntje) and adding cream (no stirring!) creates a different cup altogether. It's still quite strong but the cream and sugar tempers the bitterness. The first few sips are quite potent, then the cream turns everything turns into a big cozy hug. It's quite decadent, especially when you get the sweetness from the kluntje. This is a great tea for the morning, I've been sipping on it while getting the kids ready for school and it gives me quite a caffeine jolt. This stuff is potent! As I mentioned, if you are preparing it straight you may want to play around with the amount of leaf if it's a little too strong for your taste. With cream and sugar, this is the perfect way to unwind on a chilly winter afternoon. I don't usually prefer adding milk and sweetener to my tea, but this blend really benefits from it. Each sip feels as if you're being wrapped in a cozy blanket. I definitely want to give the TGFOP blend I mentioned earlier a try, just to see how much it differs from the BOP blend. That could be an interesting comparison of the leaf grades. I imagine the TGFOP blend would also be more drinkable without milk, as I usually prefer not to add it to my morning cup. If you are sensitive to caffeine, definitely keep this as a morning sip. But if you're not prone to the jitters, it's also a great afternoon pick-me-up. I'd recommend brewing the BOP blend in a Western style teapot, as the leaves are too small for a gongfu method. But of course, it's always fun to experiment. To lean more about this tea you can visit the Upton Tea Imports website here. As I mentioned, they have other East Frisian blends to check out as well. To learn more about the East Frisian ritual of taking tea, you can read my write-up here. Thank you to Upton Tea Imports for this sample! It helped me learn all about the East Frisian tea tradition. It's official. You're the Ken Burns of tea. (sorry for the delay in comments- blogger stopped notifying me that I had comments awaiting moderation for some reason!